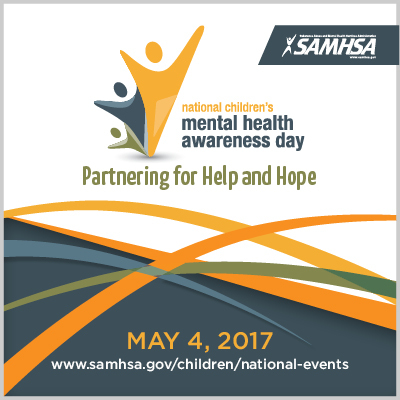 May 1-7, 2017 is Children's Mental Health Awareness Week, and today, May 4th, is Children's Mental Health Awareness Day 2017. Please join us in marking the occasion: We're sharing some of our best locum child psychiatry jobs. We've also got a rundown of children's mental health awareness resources and general information of use to all physicians and clinicians and their patients. With the theme of “Partnering for Help and Hope,” Children's Mental Health Awareness Week 2017 is designed to promote "positive youth development, resiliency, and recovery, along with the transformation of mental health service delivery for youth, adolescents, and their families," according to the National Child Traumatic Stress Network (NCTSN). Sponsored by the U.S. Substance Abuse and Mental Health Services Administration (SAMHSA), the campaign focuses on the importance of behavioral health care for "children, youth, and young adults with mental and/or substance use disorders," the NCTSN adds. With a national event in Washington, D.C. (headlined this year by U.S. Olympic swimmer Michael Phelps) featuring interactive panels and educational opportunities galore, Children's Mental Health Awareness Week is big news. Help spread the word among your patients, family and friends by sharing the resources listed below. And if you're a mental health professionals, we invite you to browse our locums child psychiatry jobs, too. Children's Mental Health Resources from the NCTSN. This list of resources from the National Child Traumatic Stress Network is truly comprehensive, including printable PDFs of detailed info for mental health professionals, educators, parents and caregivers, policy makers and many others. It may be the only resource you need; you can find it here. Mental Health Awareness Month & Awareness Day Resources. From event ideas to awareness activities, here's a list of great ways to mark Awareness Day in your community. Check it out here. Mental Health Infographics. From facts about underage drinking prevention to general mental health information, SAMHSA offers a library full of mental health infographics to share online, or print out and post at your office. You can find them here. Youth-Friendly Mental Health Online Resources from the SAHM. The Society for Adolescent Health and Medicine offers a great rundown of youth-friendly resources, designed for healthcare professionals to print and share with "adolescents and young adults looking for additional information, including online resources, support groups, peer networks, helplines, treatment locators, and advocacy opportunities." You can find it here. Family Resources from the American Academy of Child & Adolescent Psychiatry. Description. You can find it here. Child & Adolescent Mental Health Resources for Nurse Practitioners. The American Psychiatric Nurses Association (APNA) offers a vast library of child and adolescent mental health resources, including materials specifically addressing depression, substance abuse, bipolar disorder, suicide, and many more. Check it out here. "How Adults Can Support Adolescent Mental Health." "Caring adults can do a lot to promote adolescent mental health" — and this list from the U.S. Department of Health & Human Services is a great place to begin doing just that. Find it here. Mental Health Resources "For Young People Looking for Help." This teen-friendly web page and video offers a reach-out to kids and adolescents who may be experiencing depression or other difficulties related to mental or emotional health. Check it out here. Awareness Day Promo Banners (in English & Spanish). If you haven't yet joined the conversation about Children's Mental Health Awareness Day on social media, this is a great place to start, with ready-made graphics to share on Twitter, Facebook or your platform of choice. Find them here. Locum Tenens Child Psychiatry Jobs across the U.S.
To help meet the nation's need for child and adolescent psychiatrists, we're staffing locum tenens mental health jobs nationwide. Why work a locums job with Staff Care? Besides great benefits and the chance to see America while you build your medical career, locums work gives you the chance to log experience in virtually any type of facility, without having to commit to a permanent position. "Working locum tenens allowed me to work in a wide variety of places and practices both large and small, urban and rural," writes the anonymous doc behind PhysicianonFire.com. "You can take the winter off to ski the Rockies or the summer off to take a mighty RV road trip with the family. If you’re working exclusively as a locum, you can better control how much or how little you work." Learn more about the benefits of locums work here. Not seeking locum child psychiatry jobs at the moment? Maybe your friends or colleagues are! Please share these resources and career opportunities with your social networks, or connect with us on Facebook, Twitter, LinkedIn, Google+ and YouTube.